Earlier, ‘Kichadi’ to me was like porridge. Though it has a taste of its own, I like this version which smells and tastes like biriyani sans the meat of course! Wash rice and moong dal and soak for ½ hr in water. Drain on a sieve. Heat oil in a pan (with tight lid) and add cumin seeds. When it splutters, add whole spices and stir for few seconds. Add the rice and stir for a minute or two so that the rice slightly fries in oil. Add hot water, turmeric powder and salt. When it boils, cook covered on a low flame for 10 minutes. Check for doneness after 10 minutes. The grains should be separated like a pulav and should not be mushy. If there is more water left, keep covered for 2-3 minutes more. 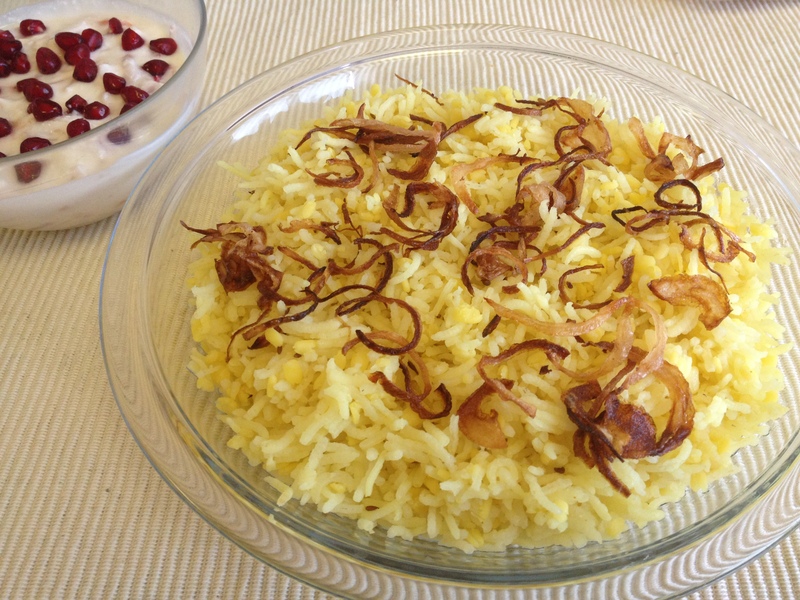 Garnish with fried onions and serve with yogurt raita. This entry was posted in Rice and Grains and tagged kichadi, rice and dal by PriyaBaby. Bookmark the permalink.